Calling Volunteers to Beautify Western Avenue! Located at the northern end of Koreatown and the southern end of East Hollywood, Wilshire Center and St. Andrews Square, Western Avenue serves its community with mom-and-pop restaurants, personal services, furniture stores, and home-oriented shops. Great Streets seeks to improve the streetscape on Western, creating a more pleasant experience for pedestrians. In partnership with the community, we will help this corridor realize its full potential as a thriving commercial and community center that can bring together its many diverse and active neighborhoods. 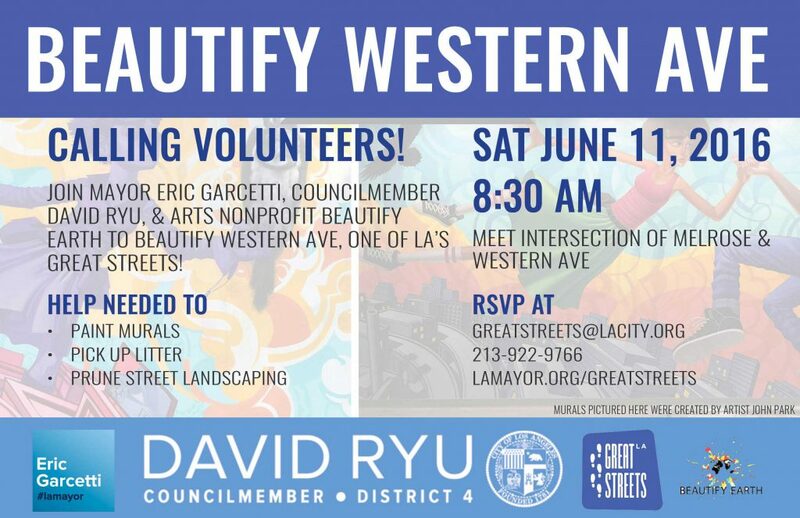 Join us for a great day to beautify Western Avenue!